LilacsNDreams: Happy 4th of July America! Yesterday I spent the day going to base to get our son, and bring him home for the weekend. So many soldiers in uniform, and in their civilian clothes too. So many of them there, and that was just the one base out of many that we have through out the united states. One of the duties of my son is he has funeral detail which is for all the fallen soldiers who are brought home to the area he is in. Anyway, he was gonna get off base early yesterday because his sergeant felt they deserved a break, and wanted to cut them loose for the weekend. Then.....our son text me right outside of base that he would not be released till about 5 p.m. ....2 hours later. Ok, that is fine, it's the army, and things happen. A few minutes later he sent me another text saying that he was "getting promoted today". WooHoo! Something he was kind of waiting on, and was starting to think he was overlooked. So, when it was announced him, and his sergeant were a bit surprised as they had not been notified prior to this. So, the day ended well for our son before he left base yesterday. He was given a certificate for this accomplishment, and of course was happy too. So, today is the 4th of July and I wish you all well during the festivities, gatherings, and etc. Please be safe. 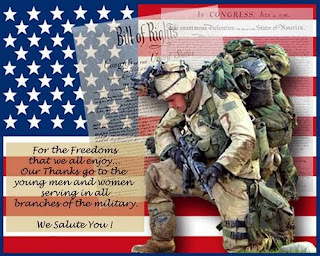 I also ask that if you see someone from the military today, someone being active now, a veteran, and so on....please shake their hand, thank them for their services, salute them, but show them how we are thankful for what they are doing for us. Those not able to be home as they are across seas please say a prayer for them. These men, and women are fighting for our rights, and freedoms of today for "US". And, remember those who have fallen for us as well. Take just a moment to be proud of our freedoms, but to also be thankful for what we have by those who fought for "US". Thanks for sharing your time with LilacsNDreams today, and see you all again soon. HAPPY 4TH OF JULY TO EVERYONE!! Have fun, enjoy, and be safe! !